“I have always believed that women are not victims, we are agents of change, we are drivers of progress, we are makers of peace – all we need is a fighting chance.” – Hillary Rodham Clinton, the Women in the World Summit. 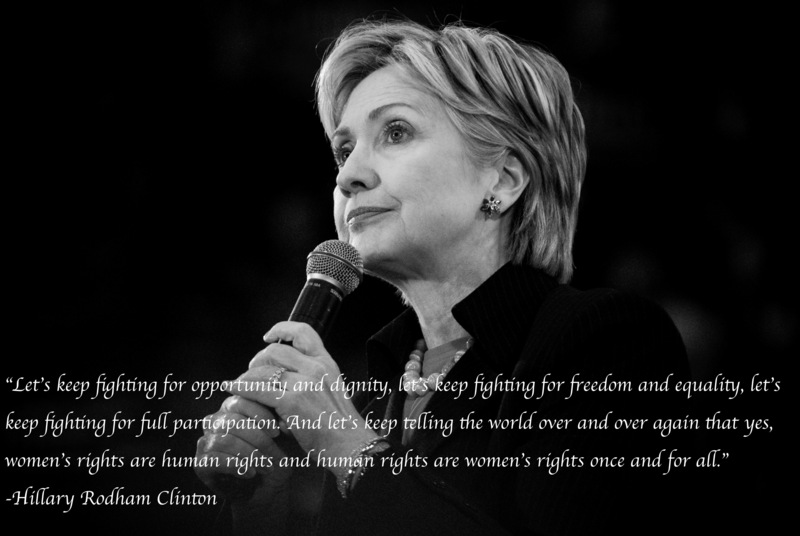 If there is one person who exemplifies leadership towards a more equal world, it’s Hillary Rodham Clinton. Uncompromising in her dedication to improving the lives of marginalized groups around the world, she is perhaps the most profound example of a woman using her political weight to create social change for the better. Clinton has dedicated her life to the pursuit of political success, a platform that allows her voice to be heard the most effectively. She has spent decades climbing the political ladder in Washington, and some believe that she will become the first female American President, a symbolic embodiment of a more equal world. Clinton has shown remarkable strength and poise throughout her career in the public spotlight. She has faced all of the common stereotypes and accusations about women in positions of power – the frigidity, the presumed weakness, and worse – with dignity that is telling of a woman of very strong character and convictions. Even amid scandal, Clinton has maintained her views and acted with professionalism and grace under pressure. While serving as First Lady of the United States, Clinton was under the most public scrutiny she had yet faced in her life. Despite enormous amounts of pressure, and her husband’s infamous and widely publicized infidelity, Clinton earned a reputation as being a strong female presence, accomplishing much and remaining resilient even amid great criticism. Clinton’s legacy as the nation’s First Lady includes her advocacy for expanding health insurance coverage, as well as an ongoing commitment to global women’s and children’s issues. She received myriad awards for her global humanitarian work, including the Mother Theresa Award, and the Living Legacy Award from the Women’s International Center. During her time served as Secretary of State under the Obama Administration, Clinton continued to pursue issues pertaining to equal rights on a global scale; she has been active in developing the Office of Global Women’s Issues, which runs more than 70 programs in 40 countries that empower women socially and economically. Her efforts to improve the lives of women stem from a staunch belief that if given the chance, women will be the most powerful force in creating peace and progress worldwide. Hillary Clinton on women’s rights. “Gay people are born and belong to every society in the world. They are all ages, all races, all faiths. They are doctors and teachers and farmers and bankers, soldiers and athletes. And whether we know it, or whether we acknowledge it, they are our family, our friends, and our neighbors. Being gay is not a western invention. It is a human reality,” of the need to end global discrimination of the LGBT community. 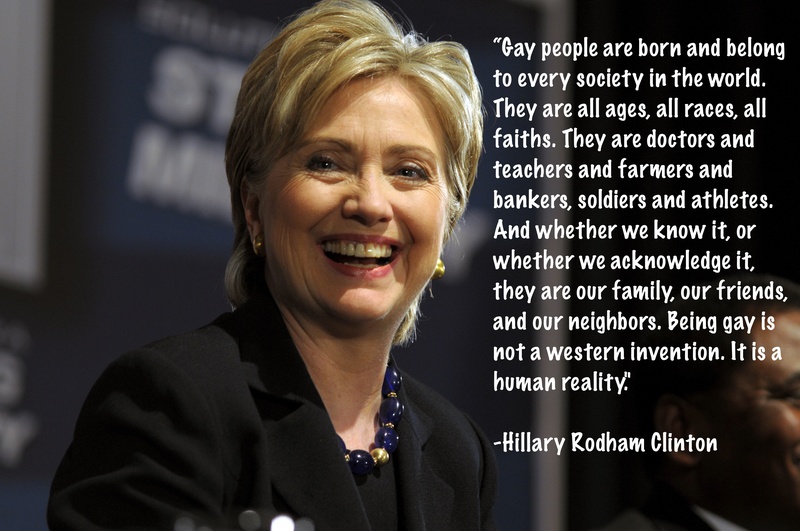 Clinton’s beliefs and support of LGBT peoples mirror a career brimming with efforts to create a more equal world for all people. She has not let the misogyny and female discrimination that runs rampant in media and politics let her falter in her fight for equal rights. She is a role model in her commitment to fighting for freedom and human rights; she is a remarkable leader to an equal world.